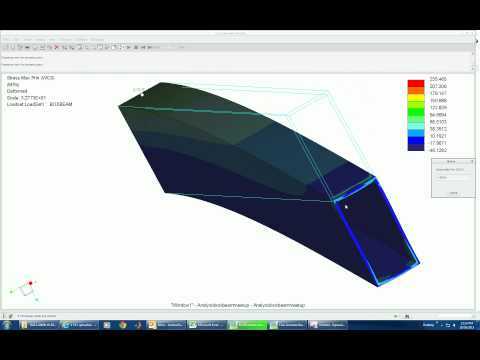 How to find stiffness of vehicle chassis frame in creo simulation? We want to evalulate stiffness in Torsional, Bending and Lateral direction. so please can we let us know any tutorial or userguide to find stiffeness. Re: How to find stiffness of vehicle chassis frame in creo simulation? Apply constraints and loads then measure deflection. I expect what you need is more help than that, something in the form of classroom training to understand how to deal with a vehicle chassis. There are some people who do this for a living because it isn't easy. Tutorial on how to analyse a beam. Compares solid element method and beam element method. I am not aware of any tutorial but this is very achievable; read the internet and see how others have done it. Always read the internet. But I suspect you already know how the measurement is to be carried out and are stuck on it's implementation in Simulate. There are Simulate resources that describe how to use beams, shells, weighted links ... all the things you need but you have to be able to 'see' how to apply them to a more complicated model. This is where this forum can help. I think you have to have a go first then describe your proposed approach and generic nature of the model to present more specific model building questions as they arise.